This is my wonderful lil' bike, 2000 VStar 650 Custom. Its an ideal bike for traveling with plenty of power for my short statue.As a child I rode scooters and bikes and as an adult rode with my husband on his Goldwing, but 5 years ago at the young age of 56 and a motorcycle trip through Colorado I decided it was time for me to do my own thing so I've been riding ever since and loving every minute of it. I can't wait for warm, spring weather. As a Grammy with 2 great little grandsons and as a recent retiree I am hoping to have plenty of time to ride. Our goal is to ride through all lower 48 states...we still have a long way to go. I also have a VStar 650 custom, they are great bikes and I've been to Rhode Island and Tennessee (from PA) with it. Don't be fooled, these bikes have the power and can keep up with the bigger bikes. My husband I prefer vacations on our bikes. He rides a Harley Dyna Glide and I can cruise right along with him, no problem. He pulls a trailer with all our camping gear and we are soooooo gone. I just love it. Good riding to you! I ride a 650 Yamaha too and I've been happy with this choice. It is a good size for me, kinda like Goldilocks -Not too Big-Not too Small, but Jusssttt Right! Hey - I really miss you!!! Do you know anyone that may want to purchase my 250? I would really like to get a bigger bike! Maybe when it gets warmer, me, you and Leann can go riding! Hey you are looking good, enjoy your retirement and from one grammy to another have fun for me too. Way to go! I started riding last year after taking the riding safety course the year before. I'll be 50 this year. I have a Honda Shadow VLX 600. It's low but I'm trying to find something even lower. I'm 5 feet with shoes and the bike is top heavy. I want to buy a custom one from ROAR Motorcycles for women. Hopefully someday! Safe Riding! 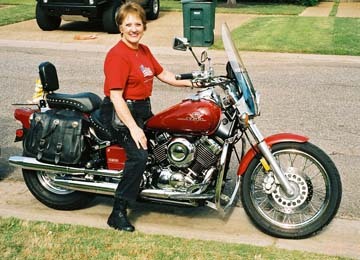 I also ride a VStar 650, an '05, and it is perfect for me! I am 58 and "got my own" 1 1/2 years ago. Been a lot of miles and look forward to many more! I intend to ride as long as I can safely do so and enjoy every minute of it! God bless you!